I think I may have touched upon this before, but I often find myself taking pictures of bicycle details, rather than the complete bicycle. I guess I am more interested in the parts rather than the whole. I wonder if other people see these bicycles the same. In looking through my vast collection of bicycle pictures I have, most are just a headlug here, brake hanger there, and not many complete bicycles. I have numerous pictures that I really have to use clues to figure out what the bicycle was that I photographed the seat lug cluster of. Take this Mario Confente. 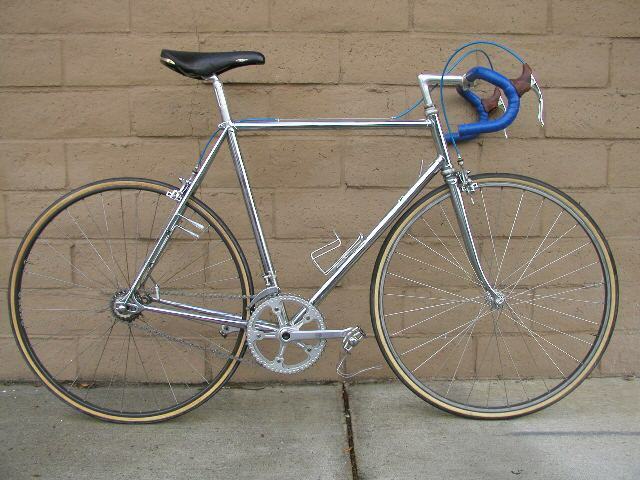 This bicycle has become the holy grail of late 1970s road bicycle collectors. I have only these five pictures take at Cirque in 2008. I really wished I had more to look at, but only more detailed pictures. Seeing a completely built of bicycle is great, just look at the post from yesterday of Nick's Medici, but I really like the bits and bobs that go into it. "It was a Medici. I wanted to make a bike that reminded me of all the things I like about various oldies I've seen or had but a bike that felt a little less fragile and irreplaceable as my old bikes. I designed the paint scheme and Anthony Mezzatesta and I painted it together. He filled some bottle cage and brake bridge holes as well as drilled and tapped for the headbadge and the flip/twist open oil port on the back of the headtube. I filed down and tapered out all the lugs. The Campy chainring bolts had just enough material to be tapped to accept the Stronglight domed chainring bolts for aesthetics. I have to tighten the saddle support until it pulls the seat down like that otherwise when I sit on it the saddle support gets plays and rattles a crumb which drives me bonkers. It's a new Brooks titanium sprinter that I hacked and stitched. " Notice the beautiful Toni Merkins style stem, also known as the limp d$&@ stem. Here is a photo of the bike before the renovation. This is Schwinn's answer to the Raleigh Superbe. This Schwinn is equipped Sturmey Archer AW 3 speed, Sturmey Dynohub with lighting, and even a locking fork! It currently has incorrect brake levers(yuck!) but we can easily correct that with period Weinmann levers. The boxlining is crisp and beautiful. I like how subtle the red is with the gold metallic paint. 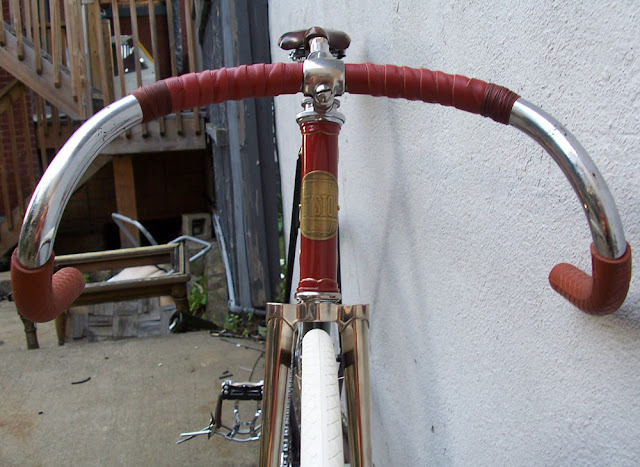 And the nice final touch is the winged Schwinn headbadge. here are a few bikes that have recently come up for sale at Via Bicycle. I may do a more involved posting about the Schwinn, but they are all interesting bicycles. 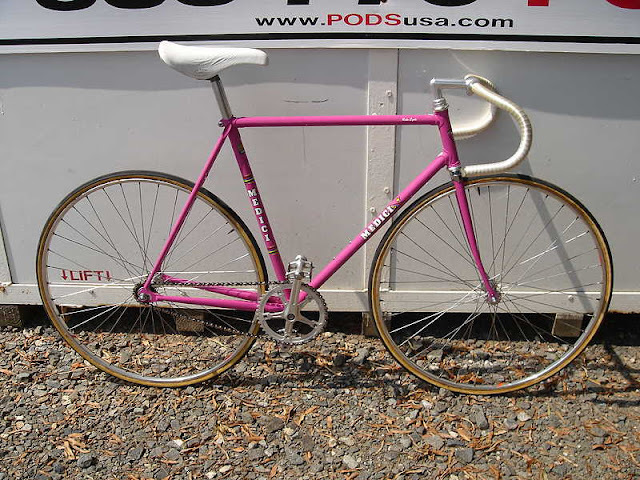 Medici track bike. Petite, with 650c wheels. PreWar Schwinn Continental. Sturmey Archer 3 speed. 1953 Schwinn Traveler. Sturmey Archer 3 speed and DynoHub. 3 Green Mice = Pino / 3 Pink Pigs= ??? Brock's BBQ catered the bicycle swap meet in Chester, VA in the spring of 2009. I saw the pig logo and immediately thought of Pino's 3 mice. I'm not sure where I got these pictures from, I have had them for years, somewhere on the internet?? It is a bicycle built by Pino Morroni with the use of Campagnolo Cambio Corsa system. But he "improved" the antiquated gear system, by using rear facing dropouts rather than forward facing dropouts used on the original design. 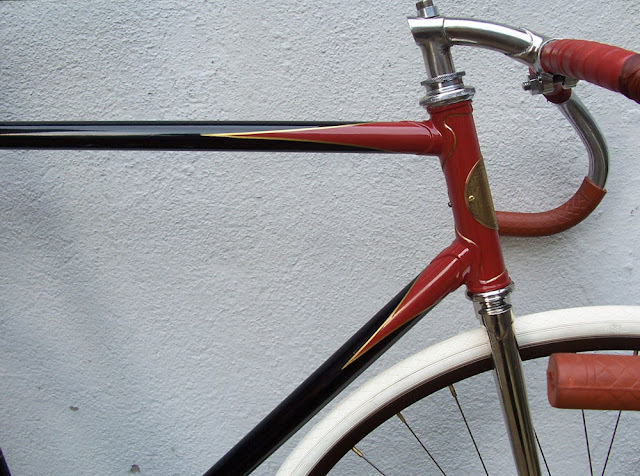 Keep in mind, this bicycle was made at least 20 years after Campagnolo stopped production of the Cambio Corsa system. It makes sense, rear facing dropouts when changing gears, but not that practical in quick wheel changes in races. Still a very nice bicycle. If anyone knows more of the story of this bicycle, please feel free to add. Also, here is a really nice article about Pino Morroni I ran across on Tam Pham's website. funny, at one time this seat clamp sold for. . .
over $500! funny. Two overzealous bidders bid this up to astronomical prices on Ebay a couple years ago. This seatclamp was used on mid 1950s to mid 1960s Italian bicycles. It was found on ones that used this seat collar type, rather than seat binders built into the seat lug. Olmo, Atala, etc used this type- Bianchi, Legnano and Cinelli used their proprietary seat lugs. The design was later simplified to a circular pattern, rather than the earlier, angular frieze like pattern. It generally sells from $10-$60, depending on condition and demand. Another awesome customer of ours brought this by the shop because he was looking for some parts for the restoration. 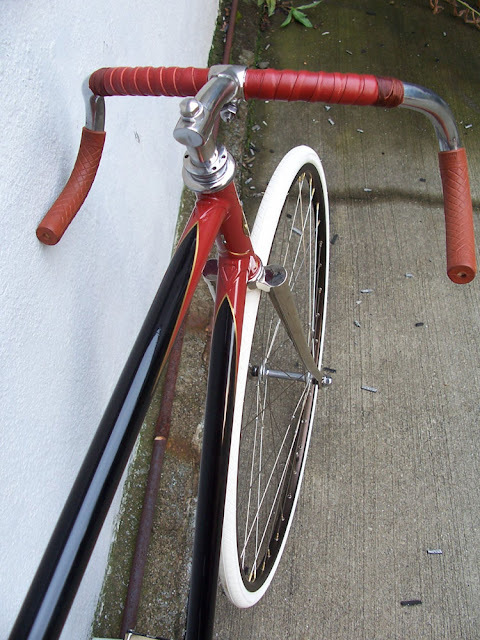 It is an early 1970s Raleigh International that was repainted by Circle A Cycles in Rhode Island. The Bronze Green is a hard color to reproduce, like the Cinelli silver. The fork is from an early 1980s Raleigh Team Professional, that actually was used in the 1st US victory of the prestigious Milk Race. Pretty cool. The bike, as photographed, was not all built up yet. The Mavic hubs laced wheels will be replaced with Campagnolo large flange Nuovo Record hubs. He purchased red Tressostar cloth handlebar tape, Nuovo Record downtube shifters, and Campagnolo long dropout adjusters from us. The bike is set up with Weinmann centerpull brakes, which was correct for the International. The bike is a project that the owner and his son are working on, they have really bonded on restoring vintage lightweights. This is a super cool bell made by New Departure, of coaster brake bicycle hub fame. They first started out as New Departure Bell Co. in 1888 and later started producing bicycle hubs, and even later automobile parts. 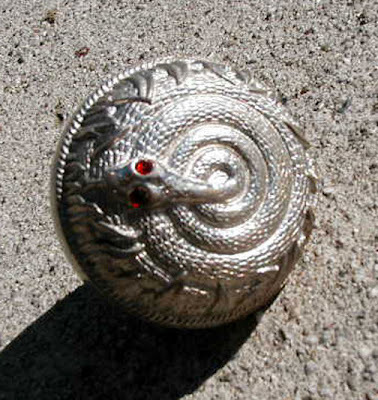 This bell was made around the turn of the century and it is very rare to find it with the "ruby" eyes still intact. 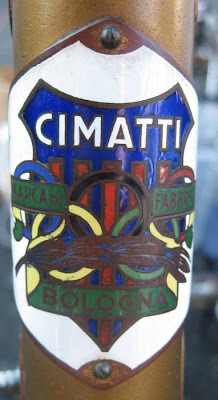 Marco Cimatti was gold medal Olympic cyclist that after retiring ran a small bicycle factory in his home town of Bologna. 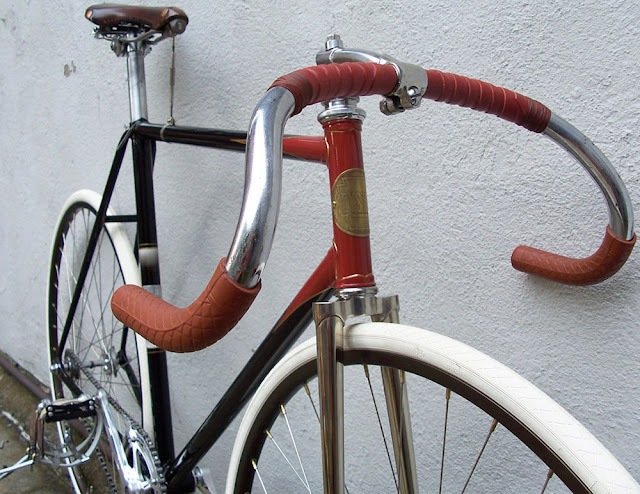 This bike is a a late 1940s bicycle, built with Campagnolo Cambio Corsa dropouts for the early gear system. 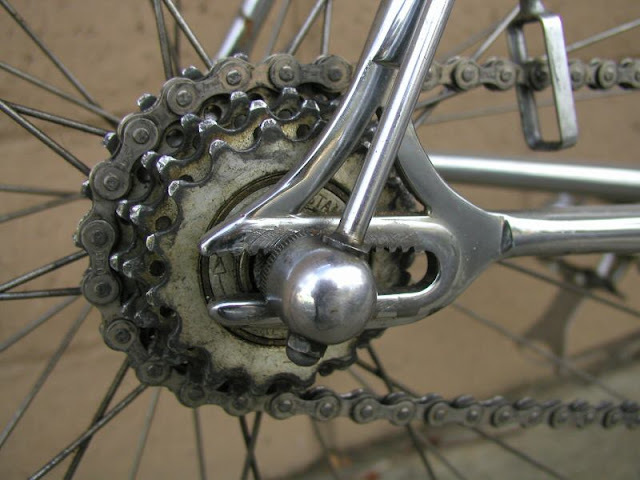 It was later updated in the early 1960s with what was modern rear derailleur. 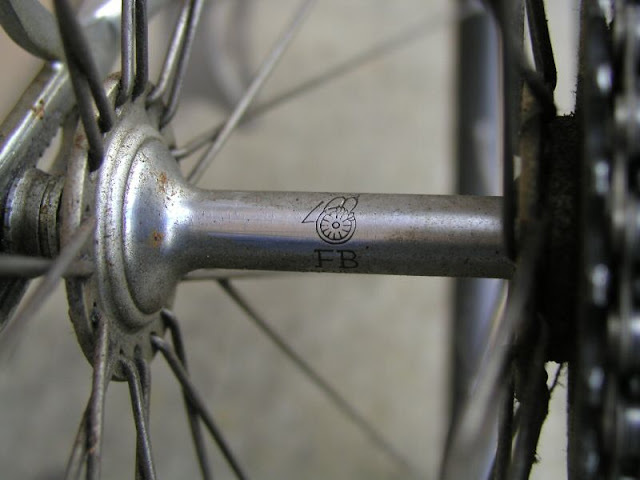 The original owner had the foresight (or per happenstance), kept the original rear splined axle and also did not file the teeth off of the rear dropouts. 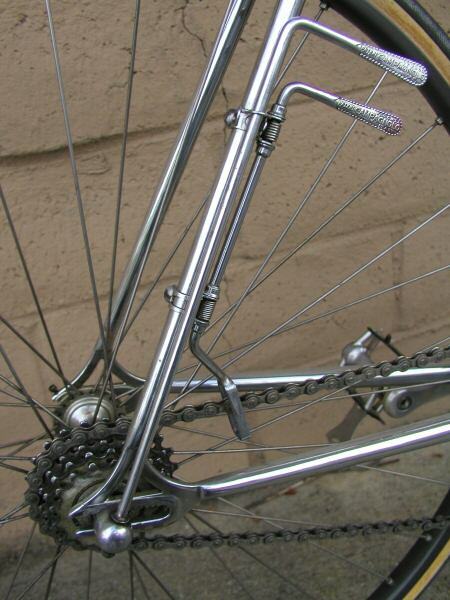 They also did not braze a derailleur hanger on the dropout either, which was also an option. The bicycle is outfitted with Universal brakes, Ambrosio stem/handlebars, Campagnolo hubs(front with quick release skewer with dogbones), and then Cimatti branded parts(crankset, headset, etc. )- probably produced by Agratti, Magistroni, Gnutti or other large components manufacturers. I'm not sure if the bicycle company is related to the later motorcycle and mopeds company, of the same name. It seems very probable, but I'm not sure. 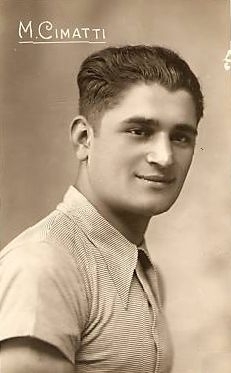 Marco Cimatti was a pro racer that raced for the Italian national team and won the men's Olympic 4000 meter team pursuit at the 1932 Los Angeles Olympics. He went on to have a distinguished journeyman racers career, highlighted by three stage wins at the 1937 Giro D'Italia. After he retired from the sport, he started a small bicycle building shop and produced what must have been a limited quantity of bikes as this is a seldom seen brand. This bike is kind of an enigma. 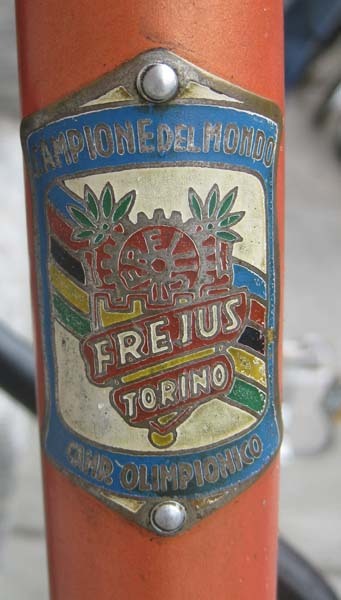 It is obvious an early 1960s Frejus track bike, but it is not as tight of a geometry as other Italian track bikes of the time. It has longer chainstays, and more relaxed angles. 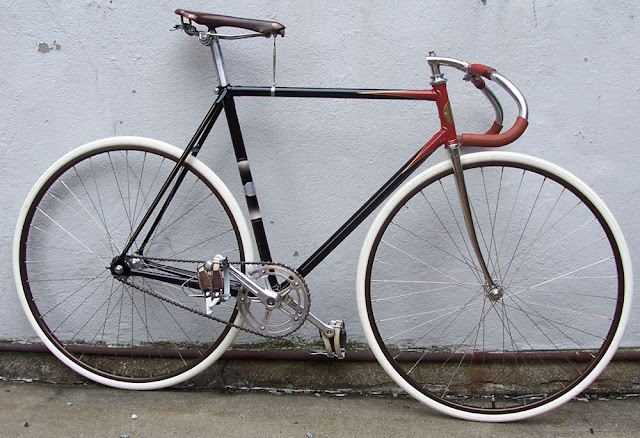 It reminds me of a British path bicycles, a single speed bike that would be used on club rides. The current owner was told that maybe it was used on road rides, rather than soley in the velodrome. I never heard of Italian bike builders doing this, new to me. I know of French single speed bikes, intended for training and club riding. any help? used in 1967 from Oscar Wastyn's shop in Chicago for $125. .6 mm butted tubs. It was a great bike!! To ride or not to ride, that is the question.